Dahlias are such a visually stunning flower and so versatile. It is hard to believe that just 30 types existed originally. From a genus of 30 species, over 57,000 cultivated forms of dahlia have been created worldwide which is quite mind-boggling. However, when you consider the natural beauty of these magnificent blooms, it is not surprising that dahlia enthusiasts the world over strive to create an even more perfect form year after year. Dahlias were first noted in the reports of a celebrated Spanish physician and explorer in 1615 named Francisco Hernández de Torres. He was interested in seeking plants from the ‘New World’ that had potential medicinal qualities. He observed the pretty flowers growing alongside pathways and they were mentioned in his report that was eventually published in 1651. As a result of this, interest in dahlias grew and subsequent travellers had seeds and tubers sent to Europe in order that they could be cultivated to produce the characteristic waxy, voluminous flowers that we still enjoy today. The Dahlia is the national flower of Mexico and appears naturally in mountainous areas. 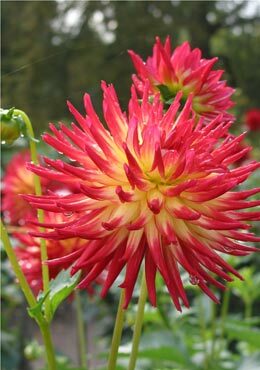 Dahlias can vary greatly in height, with some as short as 12 inches (30 cm). They can grow to heights in excess of 6 ft (1.8m). Dahlias can even reach a statuesque 8 ft (2.4) metres! The flower heads can be as small as 2 inches (5.1 cm) wide or up to 1 ft (30 cm). This makes these flowers incredibly versatile and a firm favourite with exhibition growers.